Talking about a Hard Rock band for me is more than a pleasure, and this is one plays with the furor of one of my favourite styles, kicking off at maximum level. 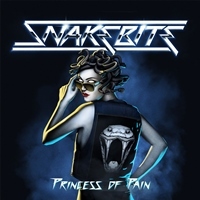 Whether or not SNAKEBITE are referencing WHITESNAKE, these guys have impressed me a lot with the first song that sounds very exciting and a chorus as it should be, in an all hard rock band, those sticky and earthy and very danceable riffs. That's "Road To Nowhere"; a classic example of how to run good old Hard Rock. The next "Cry For Rock" starts with a heavier and consistent riff, bringing a little more weight to the sound of the guys; consistency is maintained throughout the song. Even though they are a relatively new band, maturity and competence in their playing impresses anyone, sounding like a band that already has strength and presence guaranteed in Hard Rock events around the world… But we're talking about guys only 3 works launched, this being the first album. And all the representation of the band remains intact in the next two songs "Draw The Line" and "Live it Up" where the band on being radio-friendly without making it ugly. And to break that Hard Rock, what follows is a typical hard ballad that in my opinion should be presence mandatory in the work of any band that wants to establish in the hard rock scene. "After Dark" which begins with a melancholic guitars accompanied by a rhythmic guitar solo and emphasizing all printed melancholy in the song's vocals, Nikki only reaffirms all the "pain" printed on the song. Undoubtedly this was a big bet in terms of instrumental composition. The song that gives title to the album "Princess of Pain" starts in the already hectic sequence with very sumptuous vocals and backing vocals that fit perfectly to the music. The riffs are well positioned to give rhythm and speed, I note that it's been more than half of the disc and the band have not disappointed thus far. The disc follows with great songs, harmonies and quite engaging lyrics with the next songs, but the last track is where we note the versatility and power to innovate with the band relying on more cadenced riffs, but without leaving the trademark. We can see winding Heavy Metal elements in the sound "We Rise" with more weight and power. Undoubtedly the typical music that could raise hell in concert. If you're a fan of Hard Rock, it is worth pausing a few minutes of your day and watching these Germans. Recommended without a doubt!